The manipulative use of natural enemies for the control of medical and veterinary invertebrate pests has been restricted largely to various species of Diptera. Some work has been conducted on ants, cockroaches, wasps, ticks, and snails, but work on these animals has been limited. Here are reviewed the biological control agents that can be manipulated, agents that have been used successfully, agents that are being researched and agents that show at least some promise for successful application. Bay et al (1976) indicate that medically important pests differ from agricultural pests in fundamental ways: First, pests that affect humans are usually in the adult stage while those that attack crops are usually in the immature stage. This is of some advantage for control of medically important pests since it allows the control action to be taken against the immatures, thus eliminating the adult before it can cause problems. A second difference, however, is not favorable as it relates to setting tolerance levels. Whereas, an allowable number of pests (tolerance level) can be established for the biological control of a crop pest, it is far more difficult to establish for pests attacking humans. For example, an individual mosquito can be of great annoyance and can precipitate a reaction for control. In addition, low population levels of a vector may still transmit a disease and, therefore, cannot be tolerated (Service 1983). However, setting tolerance levels for veterinary pests would be more in line with those for agricultural pests. A third difference, usually a distinct disadvantage for biological control, is that the habitat utilized by medically important pests is frequently temporary as opposed to that of an agricultural crop which is more permanent. In the agricultural situation, natural enemies can coexist with pests and thus may regulate the pest populations. Additionally, in many situations the habitat exploited by the medically important pests is only an undesirable extension of human activity. An example would be the cultivation of rice, where the production of pests such as mosquitoes is usually of little concern to the grower. Interest in biological control of medical pests and vectors had its modest beginning in the late 1800\'s (Lamborn 1890). At that time the possible use of dragonflies as natural enemies for the control of mosquitoes was clearly recognized. However, as is true even today, the enormous difficulties associated with the colonization and management of these insects quickly extinguished any idea for the practical use of these predators for mosquito control. In the early 1900\'s the mosquitofish, Gambusia affinis (Baird & Girard), became stressed for biological control. This small fish, being much easier to deal with than dragonflies, was quickly utilized and transported throughout the world during the early decades of this century in attempts to control mosquitoes (Legner & Sjogren 1984). The mosquitofish, G. affinis, and a few other natural enemies were employed with some vigor until the 1940\'s. All of these control measures were curtailed sharply with the introduction of synthetic organic insecticides after World War II. The convenience and quick killing power of these chemicals was so dramatic for mosquitoes, flies and lice, that other control tactics were quickly reduced to a minor role. Interest in biological control, arose again when the succession of chemicals developed during the 1940s and 1950s began to fail, due to the development of genetic resistance in vector and pest populations. The biological control of medically important pests and vectors has made slow progress since its revival, behind that which has occurred in agricultural systems (Service 1983). This disparity is due to the problems of establishing pest tolerance levels, and the temporary unstable habitats exploited by medically important pests (Legner & Sjogren 1984). While progress in the development of biological control agents has been substantial and work in progress appears promising, an overall evaluation at this point is that biological control will rarely be a panacea for medically important pests. However, with continued effort it can be a major component in the overall strategy for the control of some of these important pests (Legner & Sjogren 1984). The literature reviewed in this section according to major taxonomic groups where some success has been achieved or where work is currently being conducted are the mosquitoes, blackflies, synanthropic flies, intermediate-host snails and cockroaches. Most effort has been directed against mosquitoes because of the human disease agents they transmit. Consequently, must of this section is devoted to mosquitoes. The successful widespread use of biological control agents against mosquitoes will require a much better understanding of the ecology of predator/prey and pathogen/host relationships (Service 1983). The opportunistic characteristics of many species (i.e., their ability to exploit temporary habitats, coupled with their short generation time, high natural mortality, great dispersal potential, and other R-strategist characteristics) pose difficult problems for any biological control agent. Mosquitoes typically exploit many aquatic habitats. Often a biological control agent will have a much narrower range of environmental activity than the target species. Thus, in many situations a number of different biological control agents and/or appropriate methods will be necessary to control even one species of mosquito across its range of exploitable breeding sources. Fish.--Several species of fishes are used for the biological control of mosquitoes, and these species together form the major successes in biological control. Unfortunately, their usefulness is limited to more permanent bodies of water, and even under these situations their impact on the target species has been only partially successful. Bay et al (1976) point out that many species of fish consume mosquito larvae, but only a few species have been manipulated to manage mosquito populations. The mosquitofish, G. affinis, is the best known agent for mosquito control. This fish, which is native to the southeastern United States, eastern Mexico and the Caribbean area, was first used as an introduced agent for mosquito control when it was transported from North Carolina to New Jersey in 1905 (Lloyd 1987). Shortly thereafter it was introduced to the Hawaiian Islands to control mosquitoes which had been introduced during the 19th century. During the next 70 years, the mosquitofish was transported to over 50 countries and today stands as the most widely disseminated biological control agent (Bay 1969, Garcia & Legner 1999, Lloyd 1987). Many of these introductions were aimed at Anopheles species that were transmitting malaria. Hackett (1937) described its usefulness in malaria control programs in Europe. He commented that its effects were not sufficient by themselves, but that the fish had a definite impact on the suppression of the disease. Tabibzadeh et al. (1970) reported a rather extensive release program in Iran and concluded that the fish was an important component in malaria eradication. Sasa and Kurihara (1981) and Service (1983) believed that the fish had little impact on the disease and that most evidence is circumstantial. Gambusia no longer is recommended by the World Health Organization for malaria control programs, primarily because of its harmful impact on indigenous species of fish (Service 1983, Lloyd 1987). The biological attributes of G. affinis, namely a high reproductive capability, high survivorship, small size, omnivorous foraging in shallow water, relatively high tolerance to variations in temperature, salinity and organic waste, would seemingly make this species an excellent biological control agent (Bay et al. 1976, Moyle 1976). However, whether this fish leads to effective mosquito control at practical costs in many situations is still debated. Kligler\'s (1930) statement that "... their usefulness as larvae-destroyers under local conditions where vegetation is abundant and micro fauna rich enough to supply their needs without great trouble, is limited. In moderately clear canals, on the other hand, or in pools having a limited food supply, they yielded excellent results ..." is probably one of the most accurate. In California this fish had been used extensively for control of mosquitoes in various habitats (Bay et al. 1976). Many mosquito abatement districts in the State have developed systems for culturing, harvesting and winter storage of the mosquito fish to have enough available for planting early in the spring (Coykendall 1980). This is particularly important in the rice growing areas of California where early stocking appears to be of critical importance for build-up of fish populations to control mosquitoes during late summer. The results of the use of G. affinis in California rice fields will be summarized below as an illustrative example of the mixed successes achieved in the field. Rice cultivation in California continuously poses one of the most difficult control problems for Anopheles and Culex species. Hoy & Reed (1970) showed that good to very good control of Culex tarsalis Coquillett could be achieved at stocking rates of about 480 or more females per hectare, and Stewart et al (1983) reported excellent control with a similar stocking rate against this species in the San Joaquin Valley. Although Cx. tarsalis appears to be controlled effectively by G. affinis, the control of its frequent companion in northern California rice fields, Anopheles freeborni Aitken, is less apparent. Hoy et al. (1971) showed a reduction of An. freeborni populations at various stocking rates of about 120 to 720 fish per hectare, but the reduction was not nearly as striking as for Cx. tarsalis. These workers surmised that improvement in control could be achieved by earlier season stocking, possibly multiple release points in fields and a reliable source of healthy fish for stocking. Despite an extensive research effort in mass culture, management and storage for G. affinis by the State of California (Hoy & Reed 1971), a mass production method has not been satisfactorily achieved (Downs et al. 1986, Cech and Linden 1987). Studies of G. affinis for control of mosquitoes in wild rice show that relatively high stocking rates can effectively reduce An. freeborni and Cx. tarsalis populations within a three-month period (Kramer et al. 1987a). The commercial production of wild rice, which is a more robust and toller plant than white rice and requires only 90 instead of 150 days to mature, has been increasing over the last few years in California (Kramer et al. 1987). In the above study, stocking rates of 1.7 Kg/ha (ca. 2400 fish/Kg) released in 1/10 ha wild rice plots failed to show a significant difference in reduction of mosquitoes from plots with no fish. A decrease in numbers of larvae was noted just prior to harvest which suggested that the fish were beginning to have an impact on mosquito numbers (Kramer et al. 1987). Numbers of fish in these plots, based on recovery after drainage, was about 100,000 individuals per hectare (ca. 32 Kg/ha) or a density of about 10 fish per square meter. However, significant control was not achieved. During 1987 this study was repeated at the rates of 1.7 and 3.4 Kg/ha of fish. Results showed an average suppression of larvae (primarily An. freeborni) of &lt;1 and 0.5 per dip for the low and high rate respectively, compared to control plots which averaged >4.5 per dip. Fish densities in the 1987 study surpassed those of 1986 by about two fold at the 1.7 Kg/ha rate and three fold at the 3.4 Kg/ha rate. It is believed that these greater fish numbers accounted for the control differences observed in the second year, although mosquitoes were not eliminated. Differences between test plots and control plots were first observed eight weeks after the fish had been planted and mosquitoes remained under control until drainage of the fields (Kramer et al. 1988). Davey & Meisch (1977a,b) showed that the mosquitofish at inundative release rates of 4,800 fish per hectare, was effective for control of Psorophora columbiae (Dyar & Knab) in Arkansas rice fields. Fish released at the water flow inlets dispersed quickly throughout the fields. This is an important attribute for controlling species of Psorophora and Aedes, whose hatch and larval development are completed within a few days. A combination of 1,200 G. affinis and about 300 sunfish (Lepomis cyanellus Rafinesque) gave better control than either four times the amount of G. affinis or L. cyanellus used separately. This synergistic effect reduces logistic problems associated with having enough fish available at the times fields are inundated. Blaustein (1986) found enhanced control of An. freeborni by mosquitofish in California rice fields after the addition of green sunfish. He speculated that the increased control was the result of the mosquitofish spending more time in protected areas where mosquitoes were more abundant and the green sunfish was avoided. The availability of fish for stocking fields either inundatively, such as in Arkansas or for control later in the season as practiced in California, has been a fundamental reason why fish have not been used more extensively in rice fields. A unique use of the mosquitofish by inundative release was reported by Farley & Caton (1982). The fish were released in subterranean urban storm drains to control Culex quinquefasciatus Say breeding in entrapped water at low points in the system. Fish releases were made following the last major rains to avoid having them flushed out of the system. Fish survived for more than three months during the summer and were found throughout the system. Gravid females produced progeny. However, no mating occurred, and after the initial increase in numbers populations of fish diminished as summer progressed. Reductions of mosquitoes from 75 to 94% were observed for three months compared to untreated areas (Mulligan et al. 1983). This control practice is now conducted on a routine basis by the Fresno Mosquito Abatement District (J. R. Caton 1987, pers. comm.). Although G. affinis has been useful for control of mosquitoes in a number of situations, clearly there are drawbacks to its use. In fact, if today\'s environmental awareness existed at the turn of the century, this fish probably never would have been intentionally introduced into exotic areas (Pelzman 1975, Lloyd 1987). The major objection to this fish has been its direct impact on native fishes through predation, or its indirect impact through competition (Bay et al. 1976, Schoenherr 1981, Lloyd 1987). More than 30 species of native fish have been adversely affected by the introduction of Gambusia (Schoenherr 1981, Lloyd 1987). Gambusia, a general predator, can also substantially reduce zooplankton and thus lead to algal blooms in certain situations (Hurlbert et al. 1972). Introductions of Gambusia have also reduced numbers of other aquatic invertebrates coinhabiting the same waters (Hoy et al. 1972, Farley & Younce 1977, Rees 1979, Walters & Legner 1980, Hurlbert & Mulla 1981). The next most widely used fish for mosquito control is the common guppy, Poecilia reticulata (Peters). It has been deployed successfully in Asia for the control of waste water mosquitoes, especially Cx. quinquefasciatus. Like its poeciliid relative Gambusia, it is native to the Americas (tropical South America). But, rather than being intentionally introduced to control mosquitoes, it was taken to other parts of the world by tropical fish fanciers. Sasa et al. (1965) observed wild populations of this fish breeding in drains in Bangkok and concluded from their observations that it was controlling mosquitoes common to that habitat. The practical use of guppies is primarily restricted to subtropical climates because of an inability to tolerate temperate-zone water temperatures (Sasa & Kurihara 1981). However, their most important attribute is a tolerance to relatively high levels of organic pollutants, which makes them ideal for urban water sources that are rich in organic wastes. In Sri Lanka, wild populations have been harvested and used for the control of mosquitoes in abandoned wells, coconut husk pits and other sources rich in organics (Sasa & Kurihara 1981). The fish occursin in India, Indonesia and China and has been intentionally introduced for filariasis control into Burma (Sasa & Kurihara 1981). Mian et al (1985) evaluated its use for control of mosquitoes in sewage treatment facilities in southern California and concluded that guppies showed great potential for mosquito control in these situations. Exotic fish have also been used for clearing aquatic vegetation from waterways which has resulted in excellent mosquito control. In the irrigation systems of southeastern California, three species of subtropical cichlids, Tilapia zillii (Gervais), Oreochromis (Sarotherodon) mossambica (Peters), and Oreochromis (Sarotherodon) hornorum (Trewazas), were introduced and have become established over some 2,000 ha of Cx. tarsalis breeding habitat (Legner & Sjogren 1984). In this situation, mosquito populations are under control by a combination of direct predation and the consumption of aquatic plants by these omnivorous fishes (Legner & Medved 1973, Legner 1978a, 1983; Legner & Fisher 1980; Legner & Murray 1981, Legner & Pelsue 1983). As Legner & Sjogren (1984) indicate, this is a unique example of persistent biological control and probably only applicable for relatively sophisticated irrigations systems where a permanent water supply is assured, and water conditions are suitable to support the fish (Legner et al. 1980). There is a three-fold advantage in the use of these fish: (1) clearing of vegetation to keep waterways open, (2) mosquito control and (3) a fish large enough to be caught for human consumption. Some sophistication is necessary when stocking these cichlids for aquatic weed control, which is often not understood by irrigation districts personnel (Hauser et al. 1976, 1977; Legner 1978b). Otherwise competitive displacement may eliminate T. zillii, the most efficient weed eating species (Legner 1986). Household storage of water in open containers has frequently been the cause for outbreaks of human disease transmitted by Aedes aegypti (Linnaeus) in less developed parts of the world. While conducting Ae. aegypti surveys in Malaysia during the mid 1960s, Dr. Richard Garcia , of UC Berkeley observed what were apparently P. reticulata being utilized by town residents for the control of mosquitoes in bath and drinking water storage containers. The origin of this control technique was not clear but it appeared to be a custom brought to the area by Chinese immigrants. Not all residents used fish, but those that did had no breeding populations of Ae. aegypti. Neng (1987) reported on the use of a catfish, Claris sp., for the control of Ae. aegypti in water storage tanks in coastal villages of southern China. This fish was considered appropriate since it was indigenous, edible, consumed large numbers of mosquito larvae, had a high tolerance for adverse conditions and could be obtained from the local markets. One fish was placed in each water source and later checked for its presence by larval survey teams about every 10 to 15 days. If fish were not found on inspection the occupant was told to replace the fish or be fined. The investigation was conducted from 1981 to 1985, and surveys over this period showed a sharp initial reduction in Ae. aegypti followed by a low occurrence of the mosquito over the four-year study period. Outbreaks of dengue were observed in neighboring provinces during this period, but not in the fishing villages under observation. The cost of the program was estimated to be about 1/15 that of indoor house spraying (Neng 1987). Alio et al. (1985) described another use of a local species of fish for the control of a malaria vector similar to the method reported by Kligler (1930). Oreochromis sp., a tilapine, was introduced into human-made water catchment basins called "barkits" in the semi arid region of northern Somalia. These small scattered impoundments served as the only sources of water during the dry season for the large pastoral population of the area. Anopheles arabiensis Patton, the vector of malaria in that area, is essentially restricted to these sites. Release of fish into the "barkits" dramatically reduced both the vector and nonvector populations of mosquitoes rather quickly. Treatment of the human population with antimalarial drugs during the initial phase of this two-year study, combined with the lower vector population reduced the transmission rate of malaria to insignificance over a 21 month period whereas the control villages remained above 10 percent. Alio et al (1985) commented that the added benefits of reduced vegetation and insects in the water sources was also recognized by the local population. This resulted in community cooperation and was expected to further benefit the control strategy by providing assistance in fish distribution and maintenance as the program expanded to other areas. The last two examples involve the use of indigenous over exotic fish where feasible in vector control programs. There are other examples where native fishes have been used in specialized circumstances (Kligler 1930, Legner et al. 1974, Menon & Rajagopalan 1978, Walters & Legner 1980, Ataur-Rahim 1981 and Luh 1981). Lloyd (1987) argued that only indigenous fish should be employed for mosquito control because of the environmental disruption induced by exotics such as G. affinis. However, he suggested that native fish should be analyzed carefully for prey selectivity, reproductive potential and effectiveness in suppression pest populations before attempting their use. Lloyd (1987) also pointed out that a multidisciplinary approach involving fisheries biologists and entomologists should be employed when developing indigenous fish for mosquito control. However, in California where native pup fishes in the genus Cyprinodon may afford a greater potential for mosquito control under a wider range of environmental stresses than Gambusia (Walters & Legner 1980), the California Department of Fish and Game discourages their use on the basis that unknown harmful effects might result to other indigenous fishes. There is also the concern that certain rare species of Cyprinodon might be lost through hybridization. Perhaps China\'s example of a multipurpose use of native fish for mosquito control and a human protein source is the most resourceful strategy. This application for mosquito control is not new. Kligler (1930) used a tilapine fish to control Anopheles sp. in citrus irrigation systems in old Palestine, where farmers cared for the fish, consuming the larger ones. According to Luh (1981), the culture of edible fish for the purpose of mosquito control and human food is not widely encouraged in China. The old Chinese peasant custom of raising edible fish in rice fields has received greater attention in recent times because of the benefits made possible through this practice. The common carp, Cyprinus carpio Linnaeus, and the grass carp, Ctenopharygodon idella Valenciennes, are most commonly used. Fish are released as fry at the time rice seedlings are planted. Fields are specially prepared with a central "fish pit" and radiating ditches for refuge when water levels are low. Pisciculture in rice fields, as noted by Luh (1981), has three major benefits: (1) a significant reduction in culicine and to a lesser extent anopheline larvae, (2) fish are harvested as food and (3) rice yields are increased apparently by a reduction in competitors and possibly by fertilization of the plants by fish excreta. Another group of fishes, the so-called "instant" or annual fishes, (Cyprinodontidae), which are native to South America and Africa, have been considered as possible biological control agents for mosquitoes (Vanderplant 1941, 1967; Hildemann & Wolford 1963; Bay 1965, 1972; Markofsky & Matias 1979). The relatively drought resistant eggs of these cyprinodontids, which allows them to utilize temporary water sources as habitat, would seem to make them ideal candidates for mosquito control. There is also some evidence that they do impact mosquito populations in native areas (Vanderplant 1941, Hildemann & Wolford 1963, Markofsky & Matias 1979). Research on the biology and ecology of several species has been conducted; however, there are no published accounts on the successful use of these fish in field situations. In California the South American species Cynolebias nigripinnis Regan and Cynolebias bellottii (Steindachner), survived the summer in rice fields, but no reproduction was observed over a three-year period (Coykendall 1980). It was speculated that they may play a future role in California\'s mosquito control program in temporary pools and possibly rice fields. C. bellottii was observed to reproduce repeatedly and to persist in small intermittently dried ponds in Riverside, California for eleven consecutive years, 1968-1979 (Legner & Walters unpubl.). Four drying flooding operations over two months were required to eliminate this species from ponds that were to be used for native fish studies (Walters & Legner 1980). It seems logical, given the biological capability of surviving an annual dry period, that these fish could be successfully integrated into mosquito control programs, especially in newly created sources in geographic areas where they naturally occur (Vaz-Ferreira et al. 1963, Anon 1981, and Geberich 1985). Arthropods.--Numerous species of predatory arthropods have been observed preying on mosquitoes, and in some cases are believed to be important in controlling mosquitos (James 1964, Service 1977, Collins & Washino 1979, McDonald & Buchanan 1981). However, among the several hundred predatory species observed, only a few have been used in a manipulative way to control mosquitoes. Dragonflies, sometimes referred to as mosquito hawks, were one of the first arthropods to be examined. Difficulties in colonization, production and handling have restricted their use to experimental observation. It is unlikely that they will ever be used extensively (Lamborn 1890, Beesley 1974, El Rayah 1975, Riviere et al. 1987a). There are a few cases where the difficulties associated with the manipulative use of arthropods has been at least partly overcome. More than 50 years ago, in a classic use of biological control, the mosquito Toxorhynchites, whose larvae are predators of other mosquitoes, was released on several Pacific Islands in an effort to control natural and artificial container breeding mosquitoes such as Ae. aegypti and Aedes albopictus (Skuse) (Paine 1934, Bonnet & Hu 1951, Petersen 1956). The releases were not considered successful, but the mosquitoes did establish in some areas (Steffan 1975). Several reasons to explain why these releases failed were low egg production, lack of synchrony between predator and prey life cycles, and selection of only a relatively small number of prey breeding sites (Muspratt 1951, Nakagawa 1963, Trpis 1973, Bay 1974, Riviere 1985). Although not apparently a suitable predator in the classical sense, there is still interest in the use of various Toxorhynchites spp. for inundative release (Gerbert & Visser 1978). Trpis (1981) working with Toxorhynchites brevipalpis (Theobald) showed that the high daily consumption rate and long survival of the larvae without prey made it a prime candidate for biological control use. Observations on adult females indicated a 50% survivorship over a 10-week period with a relatively high oviposition rate per female. All the above attributes suggest that this species would be useful for inundative release programs against container breeding mosquitoes. Studies by Focks et al (1979) in Florida, working with Toxorhynchites rutilis rutilis Coquillett, showed that this species had a high success rate in artificial breeding containers. In a 12.6 hectare residential area, about 70% of the available oviposition sites were located over a 14-day period by two releases of 175 females. Mass culturing techniques have been developed for this species and Toxorhynchites amboinensis (Doleschall) (Focks & Boston 1979, Riviere et al. 1987b). Focks et al (1986), working with Toxorhynchites amboinensis, reported that release of 100 females per block for several weeks, combined with ultra low volume application of malathion, reduced Ae. aegypti populations by about 96% in a residential area of New Orleans. The Toxorhynchites releases and not the insecticide treatment apparently accounted for most of the reduction. These workers noted that the procedure could be further refined by reducing both the number of predators and malathion applications without lowering efficacy. Mosquitoes such as Ae. aegypti and Ae. albopictus, which breed in and whose eggs are dispersed via artificial containers, pose major health hazards as vectors of human diseases throughout much of the warmer climates of the world. The massive quantities of containerized products and rubber tires which are then discarded without care or stockpiled, have given these mosquito species a tremendous ecological advantage. The recent establishment and extensive spread of Ae. albopictus in the United States underlines this point (Sprenger & Wuithironyagool 1986). The apparent inability of governments to appropriately control disposal of these containers and difficulties in location once they are discarded makes inundative releases of Toxorhynchites, either alone or in combination with other control tactics, a much more plausible approach (Focks et al. 1986, Riviere et al. 1987a). Notonectids are voracious predators of mosquito larvae under experimental conditions (Ellis & Borden 1970, Garcia et al. 1974, Hazelrig 1974), and in waterfowl refuges in California\'s Central Valley (Legner & Sjogren, unpub. data). Notonecta undulata Say and Notonecta unifasciata Guerin have been colonized in the laboratory. In addition, collection of large numbers of eggs, nymphs and adults is feasible from such breeding sites as sewage oxidation ponds (Ellis & Borden 1969, Garcia 1973, Hazelrig 1975, Sjogren & Legner 1974, Muira 1986). Some studies have been conducted on storage of eggs at low temperatures, but viability decreased rapidly with time (Sjogren & Legner 1989). At present, the most feasible use of these predators appears to lie in the recovery of eggs from wild populations on artificial oviposition materials and their redistribution to mosquito breeding sites. Such investigations were carried out in central California rice fields by Miura (1986). Floating vegetation such as algal mats and sometimes duck weed (Lemna spp.) form protective refugia for mosquito larvae, and consequently populations of mosquitoes can be high in the presence of notonectids (Garcia et al. 1974). It appears that colonization and mass production costs, coupled with the logistics of distribution, handling and timing of release at the appropriate breeding site, are almost insurmountable problems for routine use of notonectids in mosquito control. In addition to insect predators, several crustaceans feed on mosquito larvae. Among these are the tadpole shrimp, Triops longicaudatus (LeConte), and several copepod species. Mulla et al. (1986) and Tietze & Mulla (1987), investigating the tadpole shrimp, showed that it was an effective predator under laboratory conditions and speculated that it may play an important role in the field against flood water Aedes and Psorophora species in southern California. Drought resistance in predator eggs is an appealing attribute for egg production, storage and manipulationin field situations against these mosquitoes. However, synchrony in hatch and development between the predator and the prey is crucial if this is to be a successful biological control agent for the rapidly developing Aedes and Psorophora spp. In addition, the tadpole shrimp is considered an important pest in commercial rice fields. Miura & Takahashi (1985) reported that Cyclops vernalis Fisher was an effective predator on early instar Cx. tarsalis larvae in the laboratory. These workers speculated that copepods could have an important role in suppressing mosquito populations in rice fields because of their feeding behavior and abundance. Another crustacean that has shown promise for more extensive application is the cyclopoid predator, Mesocyclops aspericornis Daday (Riviere et al. 1987b). This work has shown reductions of Ae. aegypti and Ae. polynesiensis Marks by more than 90% after inoculative release of the organism into artificial containers, wells, treeholes and land crab burrows. Although not able to withstand desiccation, the rather small cyclopod predator has persisted almost 2.5 years in crabholes and up to five years in wells, tires and treeholes under subtropical conditions. This species can be mass produced, but its occurrence in large numbers in local water sources allows for the inexpensive and widespread application to mosquito breeding sites in Polynesia (Riviere et al. 1987a,b). The species is also very tolerant of salinities greater than 50 parts per thousand. The benthic feeding behavior of Mesocyclops makes it an effective predator of the bottom foraging Aedes, but limits effectiveness against surface foraging mosquitoes. Riviere et al. (1987a,b) believed that the effectiveness against Aedes is due to a combination of predation and competition for food. Perhaps the greatest utility of this Mesocyclops will lie in the control of crabhole breeding species, such as Ae. polynesiensis in the South Pacific. Further investigations may uncover additional cyclopods that can impact other mosquito species. The most important nonarthropod invertebrate predators to draw attention for mosquito control are the turbellarian flatworms and a coelenterate. Several flatworm species have been shown to be excellent predators of mosquito larvae in a variety of aquatic habitats (Legner & Medved 1974, Yu & Legner 1976, Collins & Washino 1978, Case & Washino 1979, Legner 1977, 1979, Ali & Mulla 1983, George et al. 1983). Several biological and ecological attributes of flatworms would seem to make them ideal candidates for manipulative use. Among them are ease of mass production, an overwintering embryo, effective predatory behavior in shallow waters with emergent vegetation, on site exponential reproduction following inoculation (Medved & Legner 1974, Tsai & Legner 1977, Legner & Tsai 1978, Legner 1979) and tolerance to environmental contaminants (Levy & Miller 1978, Nelson 1979). Collins & Washino (1978) and Case & Washino (1979) suggested that flatworms, particularly Mesostoma, may play an important role in the natural regulation of mosquitoes in some California rice fields because of their densities and their predatory attack on mosquito larvae in sentinel cages. Preliminary analysis using extensive sampling showed a significant negative correlation between the presence of flatworms and population levels of Cx. tarsalis and An. freeborni (Case & Washino 1979). However, these workers cautioned that an alternative hypothesis related to the ecology of these species may have accounted for the correlations. Later investigations by Palchick & Washino (1984), employing more restrictive sampling, were not able to confirm the correlations between Mesostoma and mosquito populations. However, the enormity of the problem associated with sampling in California rice fields, coupled with the complexity of the prey and predator interactions, make further studies necessary before the role of this group of flatworms in rice fields can be clearly established. The important attributes for manipulative use of flatworms mentioned above raises the question of why they have not been developed further for use in mosquito control. Perhaps the contemporary development of Bacillus thuringiensis var. israelensis DeBarjac (H-14), a highly selective easily applied microbial insecticide, may have been at least partially responsible for slowing further work and development of these predators. Their mass culture must be continuous and demands skilled technical assistants (Legner & Tsai 1978). Their persistence in field habitats may also depend on the presence of other organisms, such as ostracods, which can be utilized for food during low mosquito abundance (Legner et al. 1976). The coelenterates, like the flatworms, showed great promise for further development and use in selected breeding habitats. Chlorohydra viridissima (Pallas) is efficient in suppressing culicine larvae in ponds with dense vegetation and this species also can be mass produced (Lenhoff & Brown 1970, Yu et al. 1974a,b, 1975). However, like the flatworms, work on these predators has waned, perhaps for similar reasons as speculated for the flatworms. Microbial pesticides can be employed over an extensive range of different mosquito breeding habitats. Also, commercial production of flatworms and coelenterates would be much more costly, and storage of viable cultures all but impossible. Fungi.--The most promising fungal pathogen is a highly selective and environmentally safe oomycete, Lagenidium giganteum Couch. First tested for its pathogenicity to mosquitoes in the field by McCray et al. (1973), it is applied by aircraft to rice fields (Kerwin & Washino 1987). Lagenidium develops asexually and sexually in mosquito larvae, and is capable of recycling in standing bodies of water. This creates the potential for prolonged infection in overlapping generations of mosquitoes. Lagenidium may also remain dormant after the water source has dried up and then become active again when water returns. The sexually produced oospore offers the most promising stage for commercial production because of its resistance to desiccation and long-term stability. However, problems in production and activation of the oospores still remain (Axtell et al. 1982, Merriam & Axtell 1982a,b, 1983; Jaronski & Axtell 1983a,b,c, Kerwin et al. 1986, Kerwin & Washino 1987). Field trials with the sexual oospore and the asexual zoospore indicate that this mosquito pathogen is near the goal of practical utilization. Kerwin et al (1986) reports that the asynchronous germination of the oospore is of particular advantage in breeding sources where larval populations of mosquitoes are relatively low, but recruitment of mosquitoes is continuous due to successive and overlapping generations, as in California rice fields. The germination of oospores over several months provides long-term control for these continuous low level populations. In addition, the asexual zoospores arising from the oospore infected mosquito is available every two to three days to respond in a density dependent manner to suppress any resurging mosquito population. This stage survives about 48 hours after emerging from the infected host. Kerwin et al. (1986) indicate that laboratory fermentation production of the asexual stage of Lagenidium for controlling mosquitoes in the field is approaching the development requirements and costs for the production of Bacillus thuringiensis israelensis. A distinct advantage of this pathogen over the Bacillus is its potential to recycle through successive host generations. The disadvantage of the asexual stage is that it is relatively fragile, cannot be dried and has a maximum storage life of only eight weeks (Kerwin & Washino 1987). Thus, the focus of attention for commercial production is on the oospore, which is resistant to desiccation and can be easily stored. Axtell & Guzman (1987) have recently encapsulated both the sexual and asexual stages in calcium alginate and reported activity against mosquito larvae after storage for up to 35 and 75 days, respectively. Further refinement in techniques of production and encapsulation might make this approach a viable option for future commercial production and application. Limitations on the use of this pathogen include intolerance to polluted water, salinity and other environmental factors (Jaronski & Axtell 1982, Lord & Roberts 1985, Kerwin & Washino 1987). However, there are numerous mosquito breeding sources where these limitations do not exist and therefore one would expect to see this selective and persistent pathogen available for routine mosquito control in the near future. The fungus Culicinomyces clavosporus Couch, Romney & Rao, first isolated from laboratory mosquito colonies and later from field habitats, has been under research and development for more than a decade (Sweeney et al. 1973, Couch et al. 1974, Russell et al. 1979, Frances et al. 1985). The fungus is active against a wide range of mosquito species and also causes infections in other aquatic Diptera (Knight 1980, Sweeney 1981). The ease of production with relatively inexpensive media in fermentation tanks is an extremely desirable trait. However, problems in storage must be overcome if this fungus is to be widely used. Perhaps a drying process, now being investigated, will solve storage requirements (Sweeney 1987). Although the fungus has shown high infection rates in field trials, dosage rates have been high and appreciable persistence at the site has not been demonstrated (Sweeney et al. 1973, Lacey & Undeen 1986, Sweeney 1983, 1987). Various species of Coelomomyces have been studied over the last two decades for use in mosquito control. Natural epizootics with infection rates in excess of 90% have been recorded. These fungi persist in certain habitats for long periods; however, factors triggering outbreaks in these situations are not well understood (Chapman 1974). Some field testing has been done, but results have been highly variable (Federici 1981). In general, difficulties associated with the complex life cycle of these fungi have encumbered research on them. Federici (1981) and Lacey & Undeen (1986) have reviewed the potential of these fungi for mosquito control. Nematodes.--Among the various nematodes pathogenic for mosquitoes, Romanomermis culicivorax Ross & Smith, has received the most attention (Petersen & Willis 1970, 1972a,b, 1975; Brown et al. 1977, Brown & Platzer 1977, Poinar 1979, Petersen 1980a,b, Brown-Westerdahl et al. 1982, Kerwin & Washino 1984). This mermithid, which is active against a wide range of mosquito species, has been mass produced (Petersen & Willis 1972a) and utilized in a number of field trials. The nematode was commercially produced and sold under the name Skeeter Doom TMR, but according to Service (1983) eggs showed reduced viability in transport and the product currently is no longer sold. However, the nematode\'s ability to recycle through multigenerations of mosquitoes and overwinter in various habitats, including drained, harvested, stubble-burned, cultivated and replanted rice fields, are strong attributes favoring its further research and development for biological control (Petersen & Willis 1975, Brown-Westerdahl et al. 1982). Several field applications have shown good results and have included both the preparasitic stage and post parasitic stages with the former more applicable to the "quick kill" and the latter for more long-term continuous control such as in California rice fields (Petersen et al. 1978a,b, Levy et al. 1979, Brown-Westerdahl et al. 1982). Some drawbacks to its widespread use include intolerance to low levels of salinity, polluted water and low oxygen levels, predation by aquatic organisms and the potential for development of resistance by the host (Petersen & Willis 1970, Brown & Platzer 1977, Brown et al. 1977, Petersen 1978, Brown-Westerdahl 1982). However, these environmental problems are not generally an issue for anopheline control. For control of these species the cost of in vivo mass production clearly stands as the major drawback for this pathogen. Perhaps its most plausible use will be in specialized habitats integrated with other control strategies (Brown-Westerdahl et al. 1982). Bacteria.--The spore forming bacterial pathogen, Bacillus thuringiensis var. israelensis (H-14), was isolated by Goldberg & Margalit (1977) and the produced toxin has been shown by numerous studies to be an effective and environmentally sound microbial insecticide against mosquitoes and blackflies. Its high degree of specificity and toxicity, coupled with its relative ease of production, have made it the most widely used microbial product to date for mosquito and blackfly control. Several formulations are currently available from commercial firms throughout the world. Its efficacy under different environmental conditions and problems associated with its use have been reviewed by Garcia (1986, 1987) and Lacey & Undeen (1986). Another spore forming bacterium, Bacillus sphaericus Neide, has also shown great promise as a larvacide against certain mosquito species (Mulla et al. 1984). In general, several strains of this pathogen show a much higher degree of toxic variability among species of mosquitoes. Culex spp. appear to be highly susceptible, whereas other species such as Ae. aegypti are highly refractory. Unlike the ephemeral larvacidal activity of Bacillus t. i. toxin, some strains of B. sphaericus have shown persistence and apparent recycling in certain aquatic habitats (DesRochers & Garcia 1984). For further detail see the recent review by Lacey & Undeen (1986). Protozoa.--A large number of protozoa have been isolated from mosquitoes and other medically important arthropods (Roberts et al. 1983, Lacey & Undeen 1986). Of this assemblage the microsporidians have been studied rather intensively. Due to their complex life cycle and the in vivo production methods necessary for maintaining them, research on their practical utility has been limited. However, as Lacey & Undeen (1986) point out, if more information is developed on their life cycle, it may be found that they could play a role in suppressing mosquitoes through inoculative and augmentive releases in certain habitats. Among the other protozoa that show promise is the endoparasitic ciliate, Lambornella clarki Corliss & Coats, a natural pathogen of the treehole mosquito, Aedes sierrensis Ludlow. This pathogen has received considerable attention over the last few years as a potential biological control agent for container breeding mosquitoes (Egeter et al. 1986, Washburn & Anderson 1986). Desiccation resistant cysts allow persistence of the ciliate from one year to the next. Currently, in vitro production methods are being developed and small field trials are being initiated to determine its efficacy and practicability for field use (Anderson et al. 1986a,b). Viruses.--Numerous pathogenic viruses have been isolated from mosquitoes and blackflies. However, to date none look promising for practical use in control (Lacey & Undeen 1986). These flies, the most important of which are muscoid species, can be defined broadly as those most closely associated with human activities. Breeding habitats very from the organic wastes of urban and rural settlements to those provided by various agricultural practices, particularly ones related to the management and care of domestic and range animals. Their degree of relationship to humans varies considerably with the ecology and behavior of the fly involved. Some are more often found inside dwellings (endophilic) while others remain mostly outdoors (exophilic). The discussion that follows separates these flies by their general endophilic and exophilic habits, and is restricted to brief comments since the potential for biological control of these flies has been recently reviewed (Legner et al. 1974, Bay et al. 1976, Legner 1986). Endophilic Flies.--Povolny (1971) describes these flies as primarily dependent on human and domestic animal wastes. Musca domestica Linnaeus is by far the best known example. However, some Drosophila and Psychoda spp. also fall into this category. Certain Fannia spp. are more on the periphery but are also included here. The common housefly, Musca domestica, has been a constant associate of humans over much of our modern history. Attempts to control its populations by biological means have been extensive and on occasion successful in special situations. More frequently they have failed to reduce numbers to acceptable levels. It should be emphasized that control of M. domestica populations, as well as most other endophilic flies pestiferous to humans, would be largely unnecessary if waste products produced by human activities could be appropriately managed. Since this is not the case, efforts towards the biological control of these species have continued. Starting around the turn of this century biological control of these flies was attempted by the introduction of a broad range of different natural enemies into areas where the flies presented problems. The Pacific Islands were a focus of much attention with the introduction of dung beetles, several parasitoids and predators during this period. It was believed that the accidental introduction of an ant, Pheidole megacephala F., combined with the introduction of the coprophagous dung beetle Hister chinensis Quensel, caused significant fly reductions on the islands of Fiji and Samoa (Simmonds 1958). The Islands of Hawaii had 16 introductions from 1909 to 1967 of which 12 established. However, the exact role of these natural enemies in overall regulation of flies on the islands is still not well understood (Legner et al. 1974, Legner 1978c). Rodriguez & Riehl (1962) in California, used the novel and successful approach of chicken cockerels as direct predators of fly larvae in chicken and rabbit manure. However, this technique is utilized very little today because of the threat that roving birds pose to the spread of avian pathogens. Research over the last two decades has centered on the more highly destructive parasitoid and predatory species. Examples, such as the encyrtid Tachinaephagus zealandicus Ashmead, five species of the pteromalid genus Muscidifurax, and Spalangia sp. were evaluated for their capabilities of attacking dipterous larvae and pupae in various breeding sources. They are believed to be capable of successful fly suppression if the right species and strains are applied in the right locality (Legner & Brydon 1966, Legner & Dietrick 1972, 1974; Morgan et al. 1975, 1977; Olton & Legner 1975, Pickens et al. 1975, Morgan & Patterson 1977, Rutz & Axtell 1979, Propp & Morgan 1985, Axtell & Rutz 1986, Legner 1988b, Mandeville et al. 1988, Pawson & Petersen 1988). Other approaches have included the use of pathogens and predatory mites, and inundative releases of parasitoids and predators (Ripa 1986). Although partially successful, none of these strategies have become the sole method for fly control, and the wrong choice of a parasitoid strain may have detrimental results (Legner 1988b). Instead, the focus is on integrated controls including other methods such as cultural, adult baiting and aerosol treatments with short residual insecticides. However, it is generally agreed that existing predatory complexes exert great influences on fly densities (Legner et al. 1975b, 1980; Geden 1984, Geden et al. 1987, 1988; Geden & Axtell 1988) and that many biological control agents of endophilous flies have not been thoroughly surveyed, nor their potential adequately assessed (Mullens 1986, Mullens et al. 1986). Exophilic Flies.--These species include flies that persist in nature in the absence of humans, but whose populations can increase dramatically as a result of certain human activities such as providing more breeding habitat. They include several species in the genera Calliphora, Hippelates, Musca, Muscina, Phaenicia, Stomoxys. Some success has been recorded with the use of natural enemies against the calliphorid species in California and Hawaii, but attempts elsewhere in the world have not been effective (Bay et al. 1976). The braconid parasitoid Alysia ridibunda Say, indigenous to parts of the United States, was released into an area of Texas new to its range and successfully parasitized the blowflies Phaenicia sericata (Meigen), and a Sarcophaga species. However, the parasitoid did not maintain control and became rare within a couple of years (Lindquist 1940). The gregarious parasitoid T. zealandicus may have considerable potential for biological control of exophilic flies (Olton & Legner 1975). The range of habitats utilized by this natural enemy is considered unparalleled by any other fly parasitoid. However, extensive work with this genus, from the standpoint of field use, has not been given the this genus has not been given much attention. But one species, Tachinaephagus stomoxcida Subba-Rao, provides overall permanent reductions of Stomoxys in Mauritius (Greathead & Monty 1982). The complex of problems that confront field programs in biological control of exophilic flies has clearly had a dampening effect on research in this area. The unforseen problems associated with attempts to biologically control the eye gnat, Hippelates collusor (Townsend), in California exemplify those problems. In the early 1960s, a concerted effort was mounted to control this gnat with the use of both indigenous and exotic parasitoids in orchards in southern California. About a dozen species and strains were evaluated for several years. Some of the exotics established, but eye gnat reductions were obvious only where cultivation practices were curtailed (Legner et al. 1966, Legner 1970). Cultivation of the orchards buried the larvae and pupae of the eye gnat below the search zone of the parasitoids and cultivation also removed vegetation that offered the parasitoids protection and possibly nutrients (Legner 1968, Legner & Olton 1969, Legner & Bay 1970). Buried eye gnats emerged from several centimeters below the soil surface and thus continued to pose a serious problem (Bay et al. 1976). The recent discovery of a group of genes, called wary genes, in parasitoids of synanthropic Diptera affords greater opportunities for biological control (Legner 1987, 19898a, 1989). Inheritance of quantitative behavior associated with gregarious oviposition and fecundity in the South American parasitoid Muscidifurax raptorellus Kogan & Legner (Kogan & Legner 1970) is accompanied by unique extranuclear influences which cause changes in the oviposition phenotypes of females prior to the production of their progeny (Legner 1987a,b; 1988a). Males can change a female\'s oviposition phenotype upon mating, by transferring an unknown substance (Legner 1987, 1988a,c). Some genes in the female apparently have the phenotypic plasticity to change expression under the influence of substances in the male seminal fluid. The intensity of this response depends on the genetic composition of the male and female. Full expression occurs in the F1 virgin female (Legner 1987a, 1988a). The mated female receives a message from the male after mating that expresses his genome for the presence or absence of polygenes governing quantitative behavior, such as fecundity. The discovery of this behavior in M. raptorellus has opened questions into the nature of polygenic loci. The ability of the male substance to switch loci on or off in the female suggests active and inactive states for such lock. Polygenic loci generally have been thought to be coded for a fixed kind of expression (Wright 1986). Greater importance may be placed on liberated males during mass release strategies that seek seasonally to accelerate and increase the magnitude of parasitism, because it may be possible to convey directly to unmated females already resident in the environment certain desirable strain characteristics. In the process of hybridization, wary genes may serve to quicken the pace of evolution by allowing natural selection to begin to act in the parental generation (Legner 1987, 1988a, 1988c). Tabanidae, or horseflies, although widespread and on occasion serious pests and vectors of disease to livestock, have not received much attention. Only one successful inundative release of the egg parasitoid, Phanurus emersoni Girault, has been recorded (Parman 1928). Apparently, this effort was precipitated by a severe outbreak of anthrax at the time and since this disease diminished and other control tactics are available, interest in their biological control has not been fostered. Flies associated with cattle droppings, symbovine flies (Povolny 1971), have received the most attention for biological control over the last two decades. The primary targets for control have been the bush fly, Musca vetustissima Walker, the hornfly, Haematobia irritans (L.), and the facefly, Musca autumnalis DeGeer (Wallace & Tyndale-Biscoe 1983, Ridsdill-Smith et al. 1986, Ridsdill-Smith & Hayles 1987). The primary emphasis of control has been on habitat destruction through the use of introduced dung-burying scarab beetles. Biological control through dung destruction has been reviewed by Legner (1986). Although the introduction of dung beetles has clearly aided agriculture by reducing operating costs and increasing grazing areas through dung removal, it has not had a great impact on the densities of flies in any area. As there are no practical non-biological control methods to reduce fly numbers, and the addition of more scarabs may actually exacerbate the problem, it is thought that the most logical direction for research is to intensify world wide searches for more effective natural enemies, especially predators and pathogens. A number of pathogens have been isolated from various species of muscids and some studies have been conducted evaluating their role as control agents. For example, the exotoxin of Bacillus thuringiensis Berliner has been shown to reduce fly production under certain conditions. However, only a few of these agents appear to show great promise for manipulative use (Daoust 1983a,b; Mullens 1986, Mullens et al. 1987a,b,c). Wasps (yellow jackets) are widespread pests in recreational areas and in urban environments, yet no extended efforts to control them biologically has ever been made. However, African honeybees, or "killer bees" as they frequently are called, have invaded North America from South America through Mexico. Their first appearance in south Texas in spring of 1991 was accompanied by an increase in attacks on humans, and they have since become widespread in California and Arizona by 1999 (Legner, unpub. data; Taylor 1985). A public health problem may be expected within a year of the invasion as people become aware of these bees and succumb to their attacks. However, studies on honeybee behavior at higher latitudes in South America suggest that the public health threat is not as great as these bees\' notoriety (Taylor 1985). Nevertheless, mosquito abatement districts in California will undoubtedly be called upon for information about how to deal with the bees and perhaps to exterminate feral colonies. Most of the characteristics that distinguish African bees from European bees, such as aggressiveness, early-day mating times, degrees of pollen and honey hoarding, etc. are thought to be quantitative and, therefore, under the control of polygenic systems. Unfortunately, because of difficulties inherent in studying quantitative traits in honeybees, knowledge of this phase of their genetics is scant. In fact Taylor (1985) acknowledge that there is an overall limited understanding of honeybee genetics. Thus, we really cannot predict what will occur following hybridization of African and European races because practically all opinions are derived from their behavior in South America (Kerr et al. 1982, McDonnell 1984, Rinderer et al. 1982, 1984; Taylor 1985). Perhaps some indications can be obtained from other groups of Hymenoptera. A great deal of information about hymenopteran quantitative inheritances has been gathered recently from parasitic wasps in the genus Muscidifurax that attack synanthropic Diptera, as previously discussed. If similar systems prevail in honeybees, greater importance could be placed on drones because it may be possible for African or European drones to convey directly to unmated queens of either race some of their own racial characteristics. The rapid Africanization of European bee colonies in South and Central America could be explained partly by this process, although early-day mating of African drones has been considered primarily responsible (Taylor 1985). It is admittedly presumptuous at this time to infer similarities in the genetics of genera Apis and Muscidifurax, and the presence of wary genes in both. Some speculation seems justified where similarities might exist, however, especially as there is general agreement that permanent control of Africanized bees will probably involve genetic manipulation and mating biology (The Calif. Bee Times 1988). If present, wary genes could offer a means to the abatement of this potentially severe public health pest. However, the possible occurrence of similar hybridization events in honeybees, as has been observed in Muscidifurax, would dictate extreme caution in setting into motion any processes that might lead to the formation of new races. Available means for identifying hybridized colonies and extirpating Africanized queens (Page & Erickson 1985, Taylor 1985) are tedious and imperfect. With the understanding that hybridization events and wary genes of the kind found in Muscidifurax have yet to be substantiated in Apis, the following suggestions for African bee abatement are tentative. Deployment of Wary Genes in Abatement.--Wary genes could be used to induce in queen bees immediate behavioral changes such as a reduced dispersal tendency, greater susceptibility to winter cold, lower fecundity, or even a preference for subsequent matings to occur in the afternoon when European drones are most active. 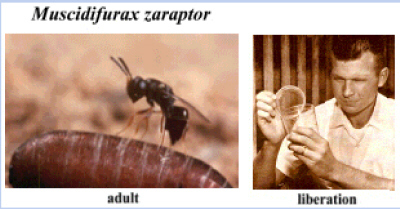 Africanized queens that mate with different races of European drones might exhibit immediate postmating depression in some cases, as was reportedly in some species of Muscidifurax (Legner 1988d). However, the offspring of crosses between African queens and certain races of European drones might be expected to show heterosis, expressed as increased fecundity and stamina, while other crosses involving different races of European bees might produce a negative effect. Crosses between hybrid queens and hybrid males could result in superactive queens after mating, following by even more highly active progeny, as was observed M. raptorellus (Legner, unpub. data). Selection favoring the superactive hybrids would tend to guarantee the survival of both parental races and a continuous formation of hybrid bees, as has been suggested for Muscidifurax (Legner 1988b). Such a process could direct events leading to the relatively rapid evolution of a new race. A superiorly adapted race might displace Africanized bees and prevail in the area. Of course this race also would have to display desirable characteristics of honey production, pollination, and nonaggression to be acceptable. Mating European queens with races of drones from feral northern European populations might causae such queens to acquire increased winter tolerance and give rise to hybrids that have even greater tolerances. On the other hand, having drones available that possess a reduced winter tolerance could increase winter kill. The selection of appropriate populations for intraspecific crosses is critical to avoid detrimental outcomes from negative heterosis, or hybrid dysgenesis, as well as undesirable positive heterotic behavior, such as an increased aggressiveness. Preintroduction assessments are essential to reveal such tendencies (Legner 1988b). The introduction of alien alleles into a population by hybridization utilizing naturally evolved parental populations would probably be less risky than introducing genetically engineered ones where no natural selection has acted priorly. Researchers working to inject laboratory engineered products into natural populations should consider what kind of behavior will be demonstrated once heterosis has had a chance to act. Unless the engineered populations can be completely isolated reproductively from resident wild populations, there is considerable risk involved. A lot of other possibilities could be imagined. However, the first step should involve a more thorough understanding of honeybee genetics, and whether or not enough similarity exists with known hymenopteran systems to derive safe and viable strategies. Certain aspects of genetics are as yet unclear in Hymenoptera, which was demonstrated with the discovery of paternal influences in males (Legner 1989d). However, there is a clear rationale for pre-introduction assessments as presently advocated for parasitic Hymenoptera (Coppel & Mertins 177, Legner 1986a, 1988b). Berg (1975), Bay et al. (1976), Garcia & Huffaker (1979) and McCullough (1981) have reviewed developments in biological control of mainly freshwater snails, especially as they relate to the transmission of trematode parasites of humans and their domestic animals. Discussion here is restricted to some pertinent points of those reviews and to some developments that have occurred since their completion. Predators.--Many general predators, including species of fish, frogs, birds and certain aquatic insects, consume fresh water snails. Domestic ducks have been used with some success in China by herding them through rice fields to forage for food. However, of all these general predators, only certain tilapine fishes have been given research consideration as possible biological control agents. Fish in the genera Oreochromis, Sarotherodon, and Tilapia feed directly on snails during various stages of their life cycle. This occurs primarily because the feeding behavior of these fishes is frequently in the vegetation or detrital zone that is also utilized for feeding by snails. Larger adult species of Oreochromis and Sarotherodon feed directly on adult snails, but this predation has not been observed for Tilapia adults. Tilapia only consume snails incidentally during their normal foraging on plant materials (Roberts & Sampson 1987). Possibly the greatest impact of these fish on snail populations is through competition for resources. Roberts & Sampson (1987) stated that generally Tilapia compete directly with the snails that feed on higher plants while Oreochromis competes with snails that feed on algae. In addition to competition for food, these fish alter the habitat and therefore have a disruptive effect on the snails\' life cycle. Certain species of sciomyzid flies are probably the most host specific predators of snails. Several hundred species have been described, the larvae of which depend on mollusks for food. Of six species that were studied for biological control, two successful introductions have been recorded and those were the release of Sepedon macropus Walker and Sepedon sauteri Hendel into Hawaii to control the intermediate host of the giant liver fluke of cattle. Success of these releases was apparently shown by a reduction in liver infections at slaughter houses (Bay et al. 1976, Garcia & Huffaker 1979). Berg (1973) emphasized that because there are several hundred species in this family with a wide range of biological attributes, they offer great opportunity for matching a certain sciomyzid with the appropriate ecotype snail. Unfortunately the scope of opportunities for use of these flies for snail control has not been given the attention it deserves. Antagonists.--Another approach for control of snails has been through interspecific competition. The large predatory snail Marisa cornuarietis L., has been evaluated rather extensively Puerto Rico and has been shown to be effective for control of Biomphalaria glabrata Say, the intermediate host of human schistosomiasis, in certain habitats, especially ponds. Suppression of B. glabrata by Marisa is primarily due to competitive feeding and to incidental predation on the immature stages of this snail (McCullough 1981). In Africa M. cornuarietis eliminates three species of pulmonate snails (Biomphalaria sp., Bulinis sp., and Lymnaea sp.) in a water impoundment in northern Tanzania. Prior to release of M. cornuarietis, three pulmonate species in addition to a melaniid snail, Melanoides sp., existed in large thriving populations. Two years after the introduction only M. cornuarietis and the melaniid snail remained, the latter in population densities similar to preintroduction levels (Nguma et al. 1982). No adverse environmental effect was recorded in this situation; however, the authors stressed that a careful examination of potential environmental risks should be made before introduction to a new area. Another competitor snail, Helisoma duryi (Wetherby), has shown promise for the control of B. glabrata. Christie et al. (1981) working with the ram\'s horn snail, H. duryi, showed that it controlled B. glabrata in artificial outdoor drains on the Caribbean island of St. Lucia. The elimination of B. glabrata may have been due to inhibition of reproduction by adults and possibly to increased mortality of immature snails. The time required for elimination was related to environmental temperature and the number of H. duryi initially released. In Africa Madsen (1983) surveyed H. duryi as an introduced species in an irrigation scheme in northern Tanzania and found it restricted to just a few drains 10 years after it had been established in the area. He noted that its failure to spread may have been related to the routine molluscacide applications to the irrigation canal system. Moens (1980, 1982) achieved successful biological control of Lymnaea truncatula Muller, an intermediate host of the trematode, Fasciola hepatica L. in watercress in Belgium, with the predatory snail, Zonitoides nitidus Muller. Predation was related to temperature, soil moisture and cover. It is obvious that the role of biological control of snails as intermediate hosts of human diseases is limited. As McCullough (1981) pointed out, it will be restricted to specific situations and will rarely, if at all, have widespread applicability. In addition it will play only a supportive role in almost all geographic areas where schistosomiasis and other snail transmitted diseases exist. However, this does not mean that biological control is not important. Indeed, any method that reduces transmission of a disease in a self-sustaining fashion is of major benefit. Legner, E. F. 1995. Biological Control of Diptera of Medical and Veterinary Importance. J. Vector Ecology 20(1): 61 p.